I wasn’t actually intending to combine all of my Anita visits into one post, but in the time that I’ve taken to write this based on my first visit, I’ve been another two times with separate people. 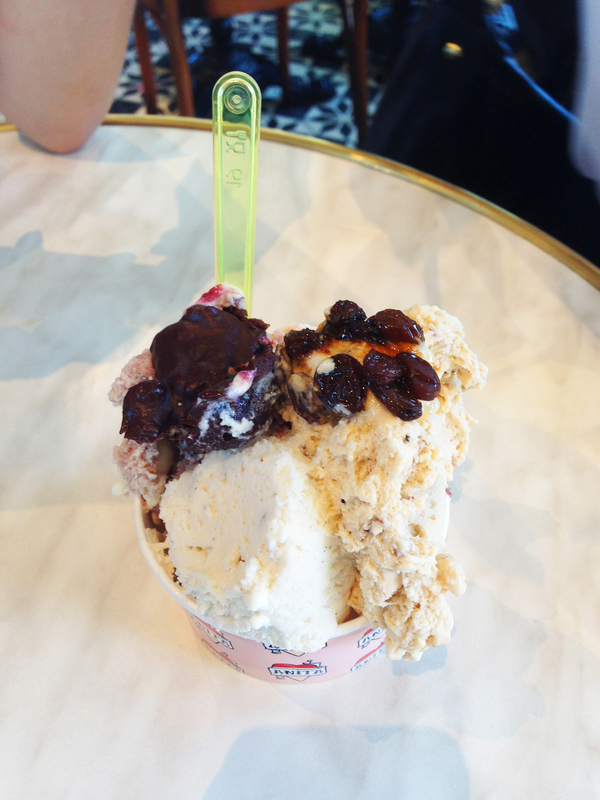 Each time always getting a jumbo serve which allowed me to taste quite a variety of flavours. 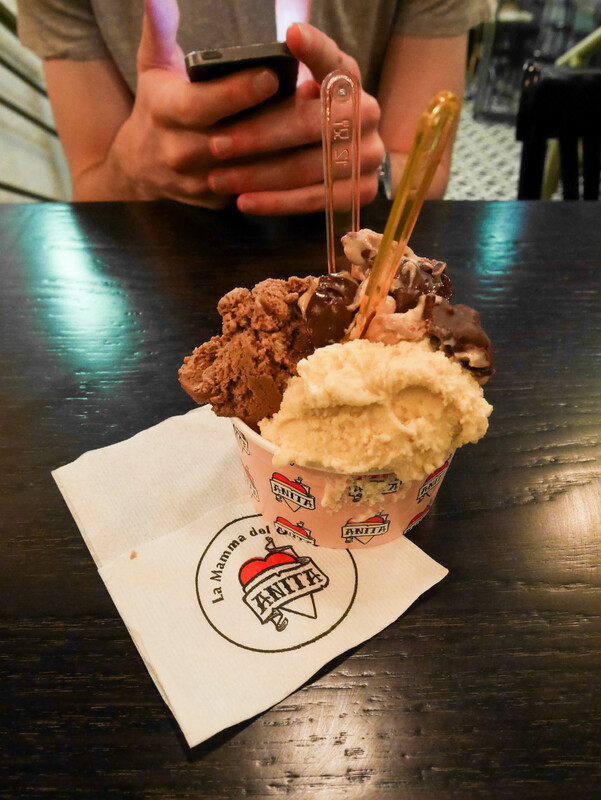 When I posted this on Instagram I made a reference to the fact that my friends claimed Anita is better than Gelato Messina. I haven’t had Messina in a long time so I can’t make an adequate comparison. However where I think Anita may lack in texture (it’s not as creamy and smooth as other places), it does make up for in a reasonable price and definitely in terms of convenience for me as it’s located at Central Park. My favourite was probably Cookieman, I loved the large cookie chunks and actually stared Robert down for eating a whole cookie piece that I had been slowly digging out of the ice cream mound and saving for the end. Ferrero is awesome because it has a nice chocolate top. Vanilla Madagascar was very disappointing, it tasted like any old vanilla ice cream you could get from buying a supermarket brand. I was hoping for a much stronger velvety vanilla flavour and maybe even bits of vanilla seeds? 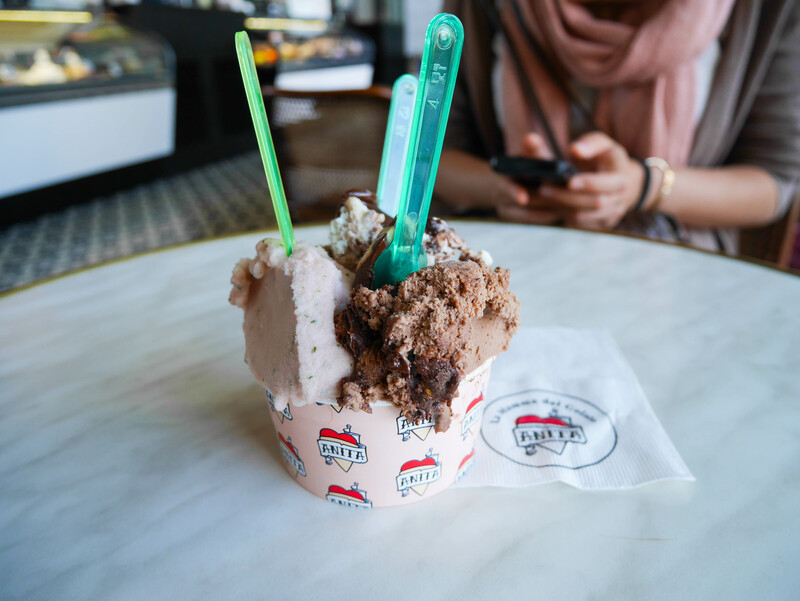 It was really good that this time around we got a fruit based gelato to mix things up. There was definitely a point in my first visit where all the flavours started to amalgamate and taste the same. With that said, the Ferrero and Kinder still did that, mainly because they’re both chocolate-hazelnut flavours. You can’t really have too much of a good thing though so no actual complaints here. The great thing about going to food places with people who have no expectations is you really get to deviate from what everyone orders and try something new. This third visit was with two old friends of mine from Malaysia who had less than 12 hours to explore Sydney. Despite time constrains they willingly came to Central Park for my sake as I was terribly busy with uni on this particular day. I’m really grateful that my friendships with some people haven’t waned despite years of not being all that close! Anyway I have to confess I don’t think I had much of this nor do I remember what little I had as I was too busy trying to catch up with them in 20 minutes before a presentation I had. I probably gravitated most towards the Chocolate Muffin with Berries just because it had a solid chocolate top. Thus is my foray into Anita so far, I’m certain this won’t be the last of my visits. Love all the unusual flavours here, although it definitely makes it so hard to choose! Definitely. At every visit my friends and I took forever to decide on flavours. We were always tossing up between Cookieman, Kinder Bueno, Loacker etc. Which is funny because they mostly tasted the same/had similar elements. I love going to Anita after a day of uni as it’s so close. I haven’t tried that many flavours but Bounty is good, if you like coconut! It was definitely my go-to spot because it is so close to my uni as well. Unfortunately I really dislike Bounty and most coconut based desserts! But I trust your taste, my friends who do love coconut have expressed how much they enjoy the Bounty flavour. i still haven’t been here, i think i should pay them a visit soon. The flavours are a definite interest winner here. Will need to check them out.